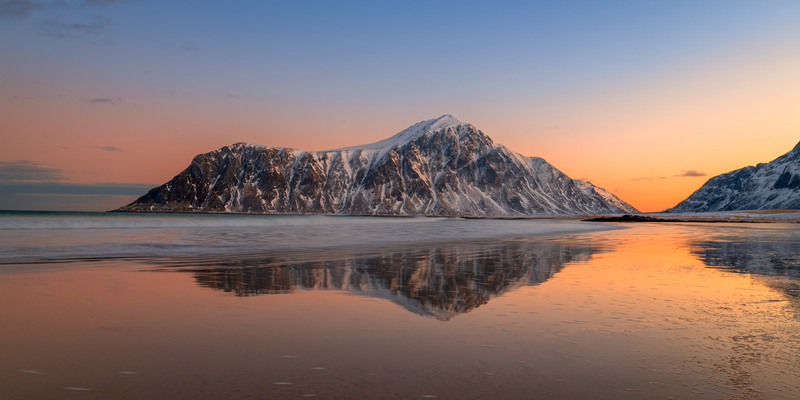 If you can catch an outgoing tide at Skagsanden Beach at the south end of the Lofoten Islands, you can capture some very nice reflections of the nearby mountains due to the beach being very flat. Of course, there can't be much wind either. On this morning at sunrise, it all came together giving us a simple, yet artistic composition. What looks to be water can actually be frozen ice, so care in walking is recommended here. . Photo © copyright by Joseph C. Filer.